Larvae chiefly eat the flower buds and shoots of both native and introduced species in the Fabaceae s.lat. a, Euphorbiaceae and Sapindaceae. They are sometimes attended by ants from about eight genera. Mature larvae grey-green or dull green, some coloured bands may be present, colour blends with the flowers being eaten. 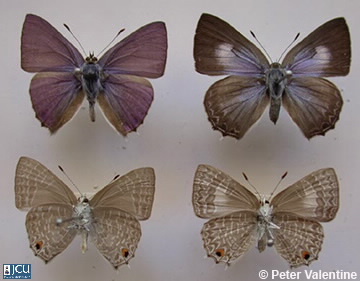 Adult male is lilac with narrow brown margins while the female is grey-black and the fore wing has a pale blue central area, hind bluish with some white rings, in both sexes the hind has 4 projections; lower surface grey brown with some brown bands and spots and a small black spot.